Discussion in 'DC Comics' started by drastic_quench, Apr 12, 2006. Wow. What an issue. Pranksters "running refridgerators" and the crosswalk men; The Flea Circus, and Toyman's Operation (TM) table were all fantastic. I really like how some silver age moments have been brought back, de-goofified, and made dangerous and fun. I'm liking this just as much as the Batman OYL. kinda disappointed Clark didn't take the ring...it'll be interesting to see what brings him back in the game. Also, can't wait to see what Lex is up to. But it was under the '86 series' numbering, making it Superman (vol. II) #192. Anyway, regarding Superman #651, I'm curious about where Hal gets the authority to hand rings out willy-nilly from. I doubt the Guardians would consent to it, given that they've already got 3 full-time members of the Corps from Earth and another Earthling who's off being the next step in Lantern evolution or whatever. The Corps' gonna develop a reputation for being Earth-crazy! Except for that one who was from Daxam. Daxam beats Krypton every time, since it's not dead. As I understood it, Hal's been reassigned to Sector 2814 as if nothing's changed. He's basically just another beat cop. I shudder to think what the law enforcement agencies of the world would look like if every cop on the street could deputize his buddies on a whim. In the Wild West days a sheriff could deputize anyone and make them a part of the law. In the Wild West days a man could become the new sheriff of a town by killing the old one, too. You know what that'd get you these days? Lots of jail time and probably a death sentence in any city that still supports it. Superman just isn't any Joe Schmo here. 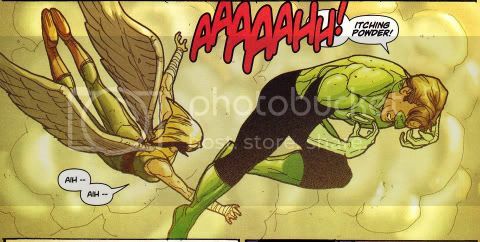 He may not have his powers, but still with his mind, knowledge, and experience, I would think he'd be quite an excellent prospect for the still-rebuilding Corp.
Obviously though, there's still too many Lanterns on Earth. He's ice cold. Not only is he a superhero, he's a test pilot. Was it a Top Gun reference? I've never actually seen that movie. One would think the Guardians or the ring itself would've chosen Clark if he were so perfect for the role of GL. I'm sure he'd make a fine GL, but the fact remains that it's kind of above Hal's pay grade at the moment to be throwing rings around like candy. He's overstepping his authority, just like he did every five minutes before he went crazy. He convinced himself that his costume looked good. That's gotta count for something. Pre-crisis Superman probably had super-imagination. Actually, there's a pre-crisis GL story where Tomar Re is supposed to stall Krypton's explosion until Kal is old enough to be recruited into the corp and become the ultimate GL. Of course Tomar fails at stalling the explosion, but the guardians see what has become of Kal and deem it a success. it was sort of a running joke during one of newsarama's "crisis recovery" features.